Whole grains are all the rage, and with good reason. They’re packed full of flavor and nutrition. But baking with them can be a bit tough. 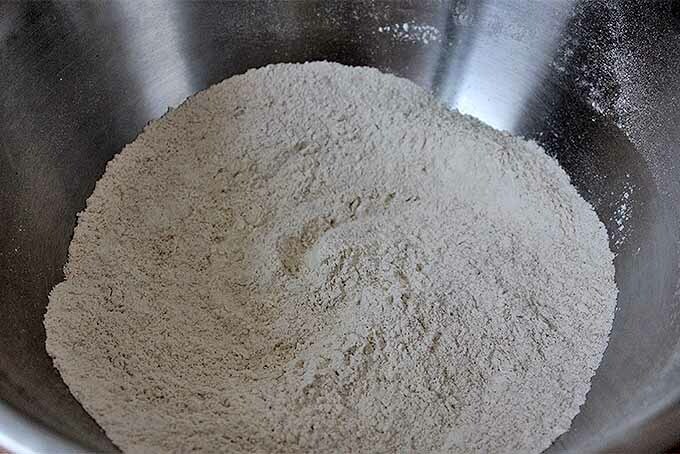 In most types of flour that are ground from wheat, the endosperm – the portion containing starch and protein – is separated from the germ and the bran, which are primarily fat and fiber. The germ and the bran are thrown away to leave a finished product that is nice and light. Spelt, white whole wheat, and bread flour. But in whole grain styles, the germ and bran remain intact, providing flavor and a huge host of nutritional benefits. Recently, cooking with white flour has gotten a pretty bad reputation. And that’s really unfortunate. To illustrate, let’s consider wheat, for a moment, as if it were an egg. The endosperm is like the white, mostly comprised of protein. The germ is like the yolk, and it contains fat, flavor, and so many nutrients. Finally, the bran is like the shell, and it’s made of fiber. Of course, if you were to eat an entire egg, you’d get the most bang for your buck as far as nutrients and flavor are concerned. But try adding a bit of yolk into your next meringue and you’ll realize how necessary the separation of the white can be! Just that extra little bit of fat will prohibit the proteins from developing any strength at all. 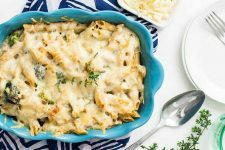 Cooking with white flour is similar to cooking with an egg white. 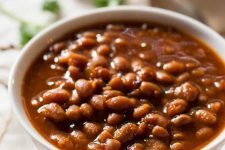 The endosperm doesn’t have as much flavor as the germ or bran, but it lends an important structural role. 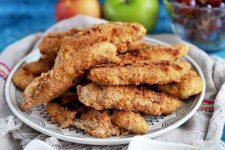 In many recipes, the protein just can’t do its job if too much fiber gets in the way. 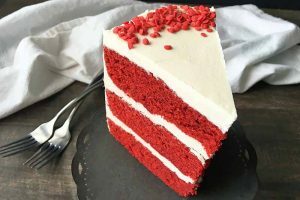 Striking the right balance of white flour and the good full grain varieties is the key to making baked goods that reach their full potential for flavor, texture, and nutritional content. 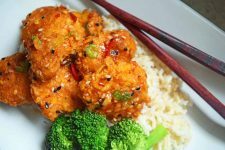 Fortunately, there are a few different ways that you can work these grains into your diet without compromising on texture, and greatly improving the taste. The most important step in baking with whole grains is ensuring that you have fresh, high quality flour. Because it contains the oils from the germ, it can go rancid much more quickly than a bag of white flour. Make sure to purchase yours from a store that has a high turnover rate. Otherwise, you’re likely to get some that’s pretty old. Once you’ve opened the bag, store it in an airtight container in the refrigerator or freezer. This will help to extend its shelf life. When it’s stored cold, it will last for 3-6 months. 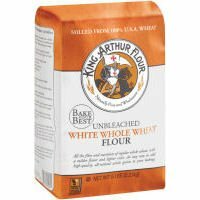 Some of my favorite brands are King Arthur Flour, Bob’s Red Mill, and Arrowhead Mills – all of which are available on Amazon.com. All three make high quality blends that are widely available and reasonably priced in the US. 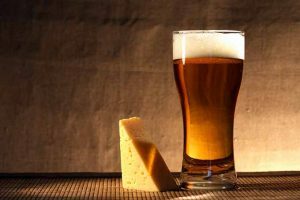 Of course, for the freshest and tastiest option, you could also look for a local miller, preferably one who stone grinds their product. My favorite kinds come from a local farm that mills their own wheat, and delivers their wares around the state twice per week. It doesn’t get much fresher than that! Though you could easily grind your favorite whole grains right at home! And don’t forget to read our Complete Guide to Countertop Grain Mills to make the best selection for your needs. This method is a bit more costly, but well worth it if you want to make the most delicious baked goods. 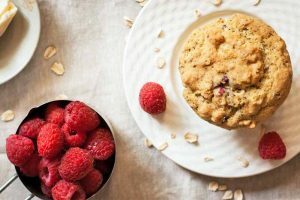 Various grains and flour blends will behave differently in your recipe, so it is important to know how to navigate and select from the many types that are available. 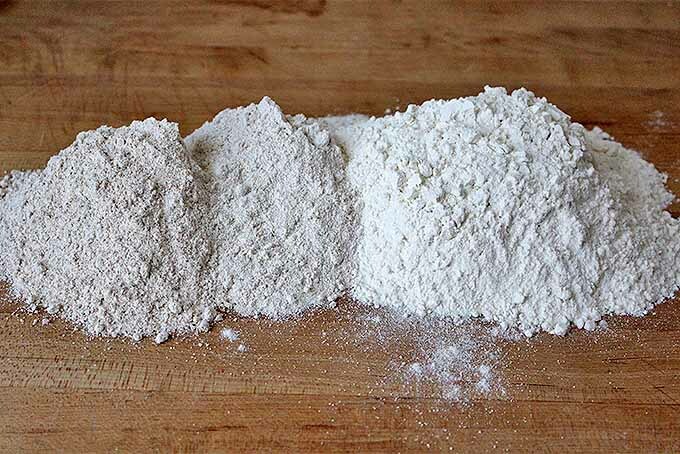 Our guide to types of flour can help. 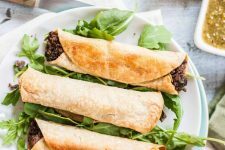 Sour Barley Pita – Get the Recipe NowIf you are making cake or scones, use a whole wheat pastry type. 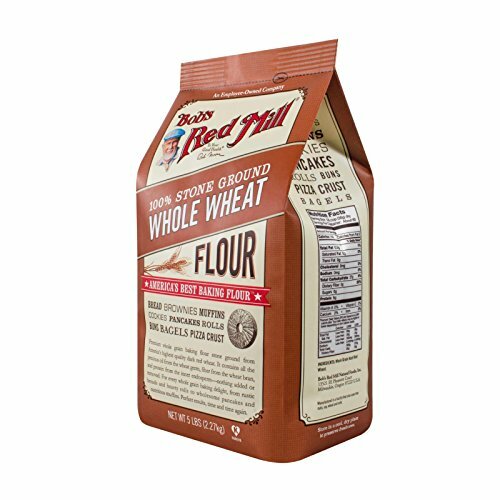 Ground from a soft wheat variety, it contains less protein and will not add the same density as a traditional whole wheat blend made with hard red wheat. 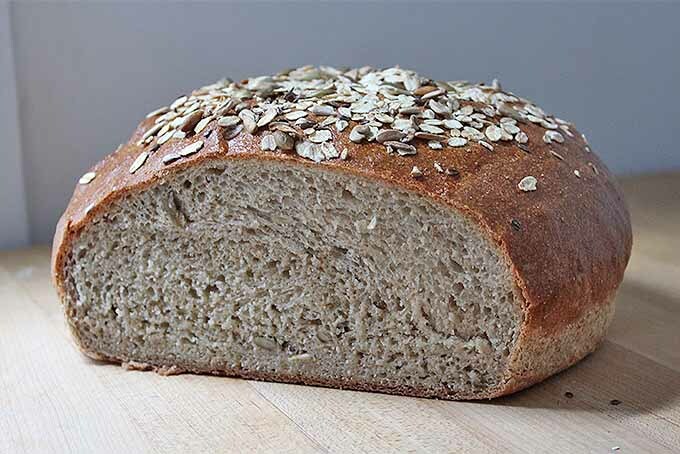 When making bread, white whole wheat (ground from a white wheat berry rather than red), barley, and spelt flour will produce the most similar results to all purpose or bread. 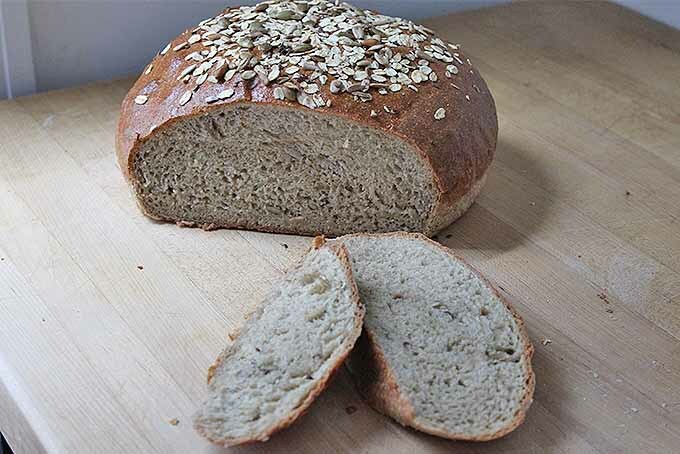 Whole wheat (ground from a red wheat berry) and rye are also delicious, but require a bit more attention. They will need more moisture to keep it from yielding a dry, dense loaf. Rye prefers an acidic environment to slow down the enzyme amylase that breaks down the starches in grain. If you’re playing around with cookies or quick breads, whole wheat pastry, white whole wheat, barley, and spelt are my favorites. 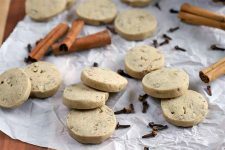 They will add great flavor without creating a product that is too dense to enjoy. Once you’ve chosen the appropriate variety, it’s important to keep the best ratio in mind to achieve a tasty and satisfying final product. And I don’t recommend a 1-to-1 substitution. 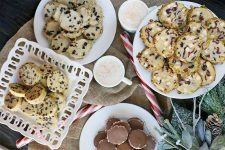 Like I mentioned before, the concentrated starch and protein found in white flour is necessary for a light and well-structured bread, cake, cookie, or scone. 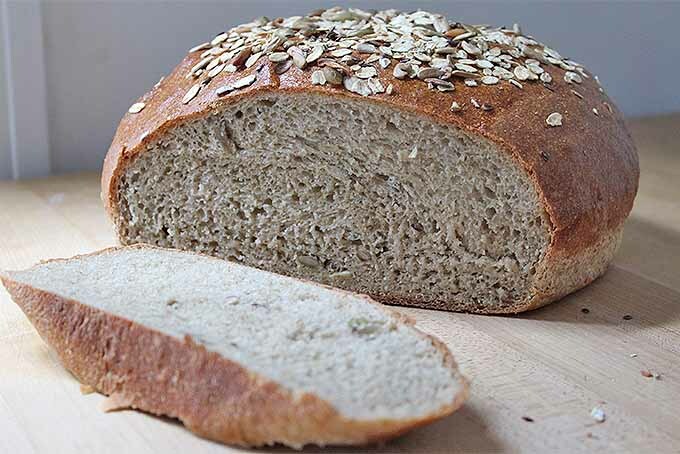 Substituting a full grain variety for all of the white flour will almost always leave you with something resembling a brick – heavy, dense, dry, and less than enjoyable. 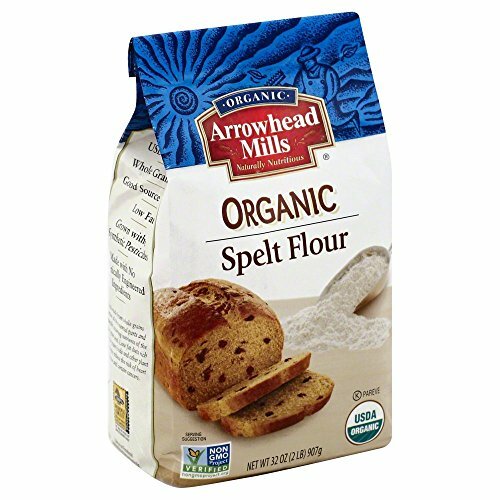 Instead, when making cakes, cookies, scones, and quick breads, try substituting 30-40% of the flour with your whole grain alternative. This will bump up the flavor and nutrition without harming the texture. When making artisan breads that require allowing the yeast to rise and proper kneading, you can up this quantity just a little bit more. Fifty percent whole grain will work just fine. I do recommend using bread flour rather than all-purpose for the remaining 50%, to ensure that you have developed enough gluten. 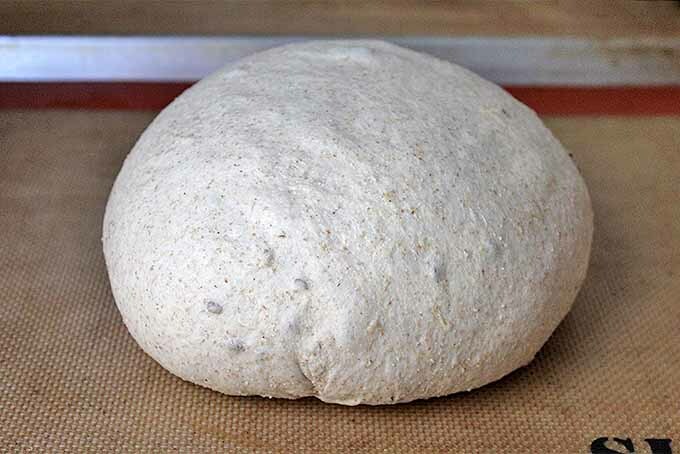 Don’t hesitate to add an extra tablespoon of water if your dough feels quite dry when you are halfway through kneading. Once you’ve mixed your dough or batter, one last way to ensure a good end result is to let it rest for a little while. Ten to twenty minutes will create a noticeable difference, but if you can, try leaving it in the fridge overnight. The moisture will soften the germ and the bran, creating a much nicer texture as well as a treat that is easier to digest. 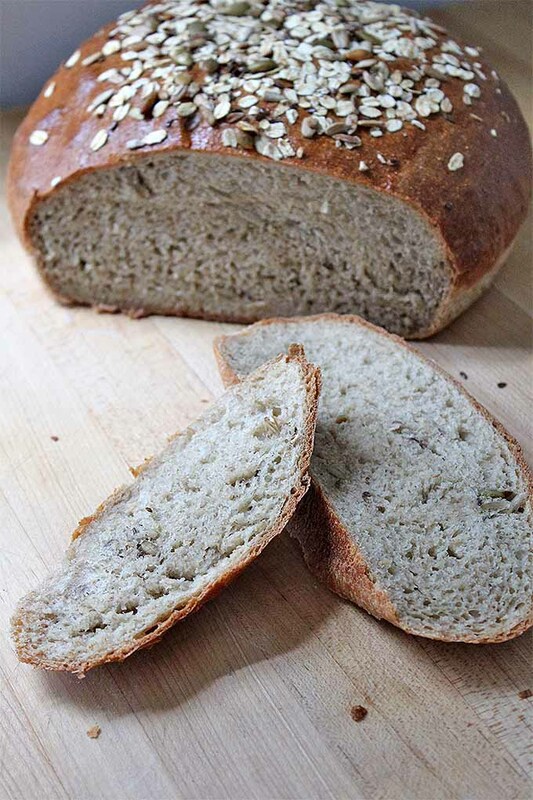 My favorite way to incorporate whole grains into baking is with sourdough bread. The long fermentation process breaks down the fiber that makes grains difficult to work with in other baking applications. 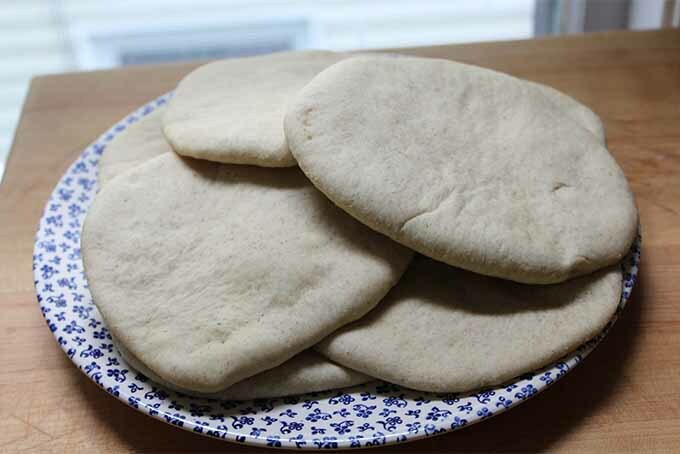 Plus, it really develops the nuances of flavor present in the different kinds of flour. 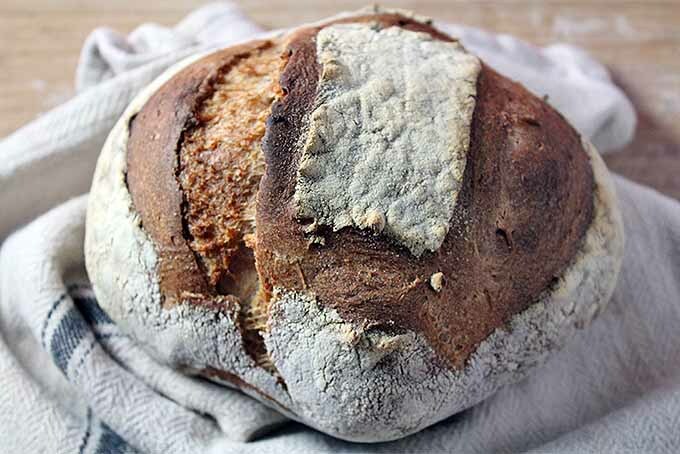 Artisan Sourdough Bread – Get the Recipe NowBecause of this long bacterial fermentation, fermented sourdough can handle a much higher ratio of whole grains than other baked goods. I know some bakers who will make theirs with 100% whole grain, though I’ll admit this is a bit too dense for me. About 65% is the maximum that I enjoy. To give my recommended percentage sourdough a try, follow my guide to sourdough. Instead of using 100 grams of whole wheat and 200 grams of all-purpose flour, reverse these amounts. Try 200 grams of a whole grain mix with 100 grams of white. Are you ready to put some of these tips into practice? 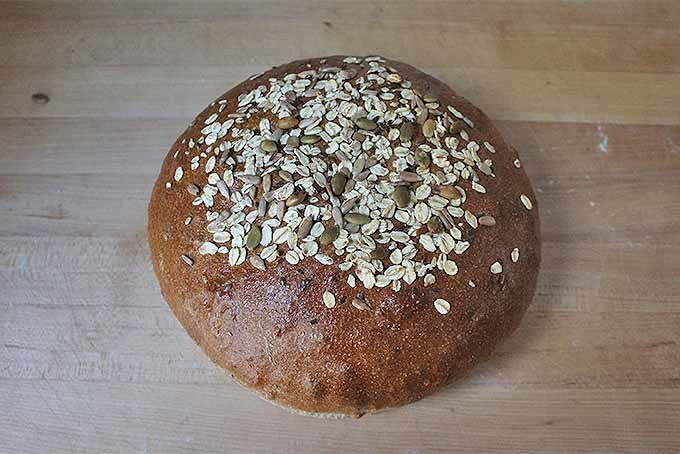 Try making this multigrain loaf. 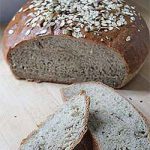 I’ve applied all of the tips outlined above to my basic bread recipe to create a hearty, delicious, multigrain loaf. 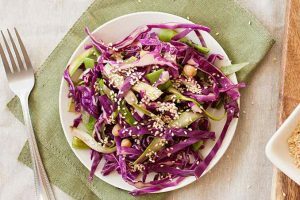 I fold in some seeds to give it even more flavor, texture, and nutrition. 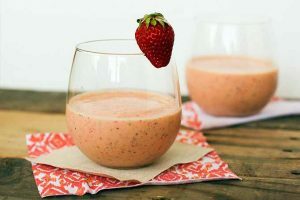 You’ll be amazed that something so healthy can still be so light. Healthier baking can be difficult, with dense and dry results. 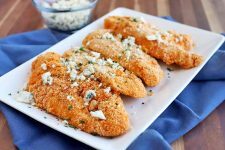 Learn how to incorporate flavorful whole grains without sacrificing quality. Read more. Mix together the flours, sugar, salt, and yeast. Form a small well in the center of the dry ingredients and pour in the water. Using a bowl scraper or clean hands, pull the flour mixture into the water and slowly work the ingredients together. Once the water is incorporated and the flour has formed a shaggy dough, turn it out onto a clean counter. Let the dough rest for 15 minutes to soften the bran and germ. Knead the dough for 8 minutes. 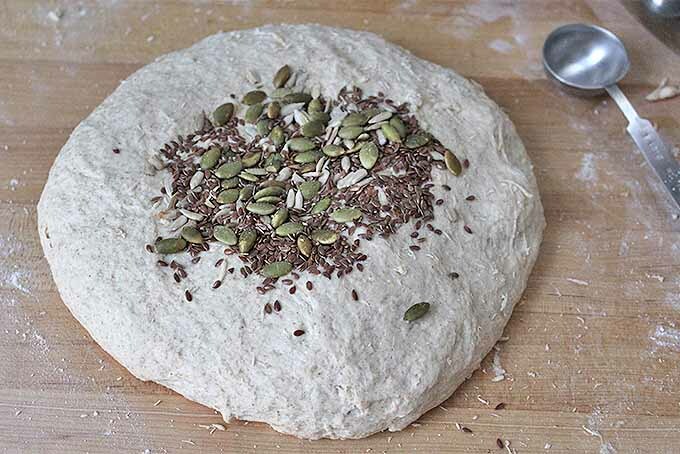 Add half of the sunflower, pumpkin, and flax seeds, and knead for 2 minutes more, until the dough forms a smooth ball and you can perform a successful windowpane test. Place in a large, oiled bowl, covered with a damp towel. Allow to rest at room temperature for an hour, or until doubled in size. Let proof at room temperature until you can touch the top lightly and it springs slowly back into place. Brush with whisked egg and sprinkle the remaining seeds and the rolled oats on top. Bake at 375°F for 25 minutes, or until the inside of the bread reaches 180°F. 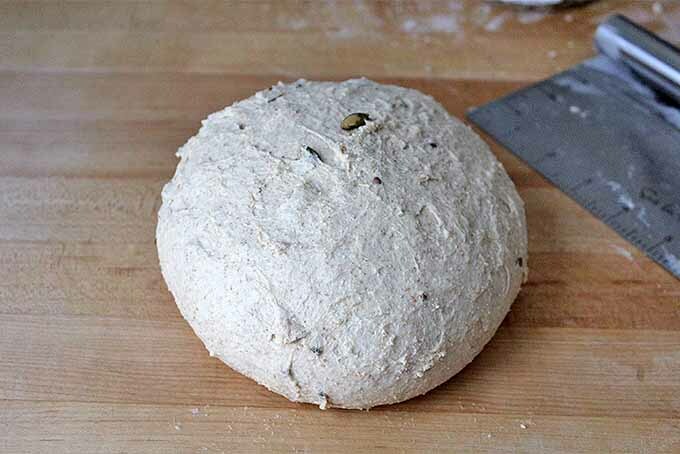 First, combine all of your dry ingredients – the spelt, white whole wheat, and bread flours, sugar, salt, and yeast. 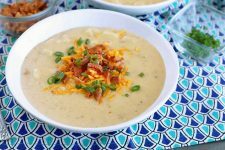 This can be done in a large mixing bowl, or on a clean countertop. Form a well in the center of the dry mixture, and add the warm water. With your hands or a bowl scraper, form the dough by gradually pulling the flour into the water at the center of the well. 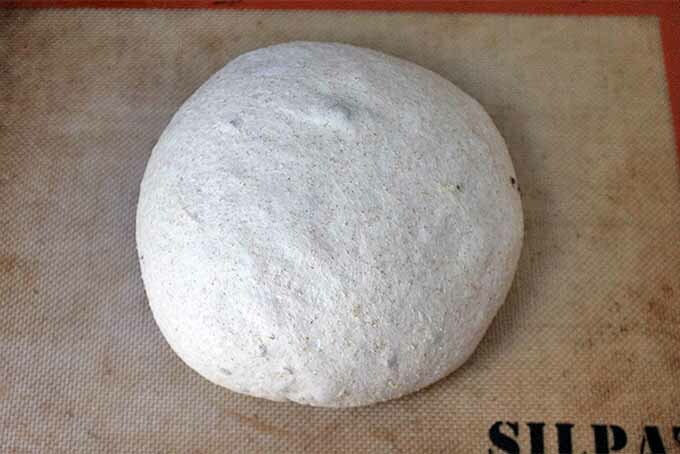 Once you’ve formed a shaggy dough, turn it out onto a floured countertop. Let the dough rest for about 15 minutes. This will help to soften those hearty whole grains. Then add half of the raw sunflower, flax, and pumpkin seeds. Continue to knead until a smooth ball forms. Perform the windowpane test to check to see if the gluten structure is ready to form a nice loaf. Coat a large mixing bowl with oil, and place your dough inside. 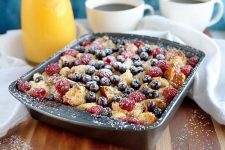 Cover with a clean kitchen towel, and set aside to rise at room temperature for about an hour. 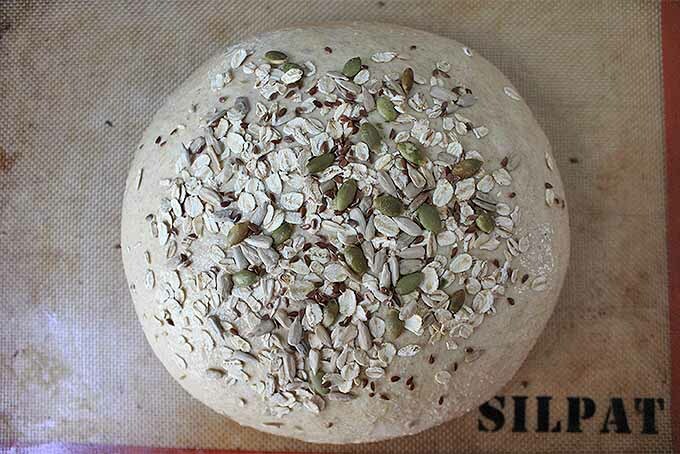 Shape into a round loaf, then proof at room temperature on a baking sheet prepared with a nonstick liner. You’ll know it’s ready when the dough springs back under light pressure. Lightly beat an egg in a small bowl, and brush your egg wash on top of your loaf. Sprinkle the remaining seeds and your rolled oats on top. Reposition any escapees that make their way onto the countertop. Bake at 375°F for about 25 minutes, or until brown and firm on the outside. If you want to check the internal temp of your loaf, it should be at about 180°F when it’s done. Cool briefly on a wire rack, then slice and enjoy. 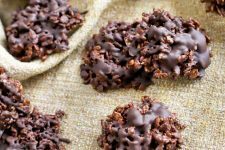 Whenever I hear of a baked good that’s described as tasting “healthy,” I cringe. 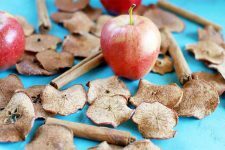 It has become far too commonplace to assume that if something is dense and dry, it’s also guilt-free, and that good flavor and a nice texture it means something must be bad for you. Hopefully the techniques for multigrain baking described above will change your mind! 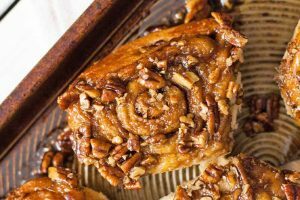 Your baked goods can be light, tasty, and free of guilt. 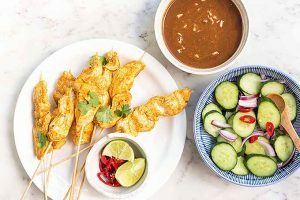 Don’t make yourself choose between healthy and delicious – you really can have both. 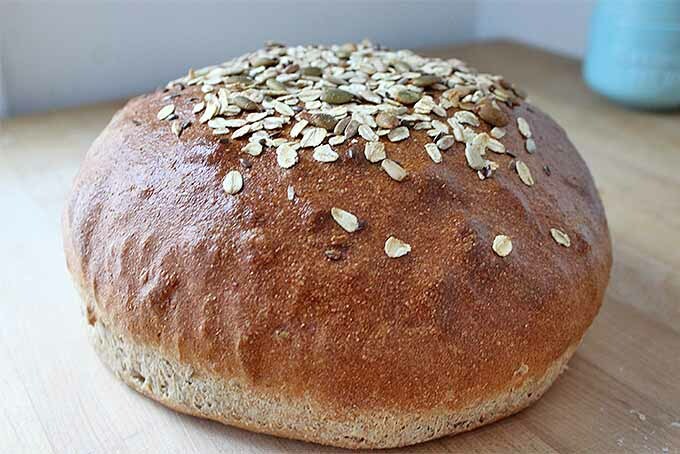 How do you like to incorporate whole grains into your baking? Let us know in the comments below! Bread and recipe photos by Kendall Vanderslice, © Ask the Experts, LLC. ALL RIGHTS RESERVED. See our TOS for more details. Product photos courtesy of King Arthur Flour, Bob’s Red Mill, and Arrowhead Mills. With additional writing and editing by Allison Sidhu. Hey! Thanks for sharing. I will surely try this out.